Create a special room sign for brothers who share a room. Select two or three of our cartoon boys to resemble your kids, and personalize your sign with up to 3 names. You can even add accessories (such as toy trains or soccer balls) to respresent your kids favorite sports or activities. 1/4" thick hardboard sign features a glossy plastic front surface printed in full color. Available in 2 sizes - 6x8" and 8x10". Command strips for hanging are included. This item is available with your choice of any of our cartoon kids. Click any category to see the available selections. Click any age range to see the available options. Make note of the HEAD NUMBER shown beneath the ones you choose. For example, G10, G12A, etc. Kids are available with fair, medium, or dark skin and blonde, brown, red or black hair as well as glasses, earrings, and a variety of clothing options. See the colors and clothing tab for examples of all the colors and things you can add to your people! Click any age range to see the available options. Make note of the HEAD NUMBER shown beneath the ones you choose. For example, B10, B12A, etc. Kids are available with fair, medium, or dark skin and blonde, brown, red or black hair as well as glasses, hats, and a variety of clothing options. See the colors and clothing tab for examples of all the colors and things you can add to your people! 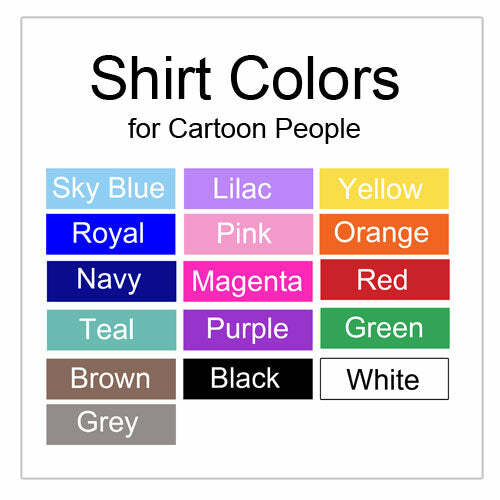 Click any image to enlarge and see examples of skin colors, hair colors, clothing colors for your cartoon kids. Click any image to enlarge and see examples of clothing styles, add-ons and accessories that you can add to your cartoon kids. Please read our RECOMMENDATIONS for adding accessories. Email Address for Preview: If you would like a preview of your item please enter your email address below and we will send a preview within 24 hrs. If you choose this option we cannot print your order until you have approved your preview, so please check your email often. Requesting a preview usually adds 1 day to the processing time for your order. Big Brother / Little Sister Personalized Teddy Bears - Set of 2 Coco Bears, 15" and 13"
Big Brother / Little Brother Personalized Teddy Bears - Set of 2 Coco Bears, 15" and 13"
Big Sister / Little Brother Personalized Teddy Bears - Set of 2 Coco Bears, 15" and 13"
Big Sister / Little Sister Personalized Teddy Bears - Set of 2 Coco Bears, 15" and 13"
Big Brother / Little Brother Personalized stuffed Sloths - Set of 2 Tan sloths, 18" and 12"
Big Brother / Little Sister Personalized stuffed Sloths - Set of 2 Tan sloths, 18" and 12"
Big Sister / Little Brother Personalized stuffed Sloths - Set of 2 Tan sloths, 18" and 12"
Big Sister / Little Sister Personalized stuffed Sloths - Set of 2 Tan sloths, 18" and 12"